Chicken curry is a popular dish in most of Asia, and in China it is usually something that someone makes when cooking for themselves. You do not usually find it in restaurants since people usually go to restaurants with a group of people and eating is sort of like a social event. Sometimes I find a place that serves it, and I really like it. While I was at the grocery store the other day I found some curry mix, so I also bought the things I needed to make some. You can use any type of chicken. 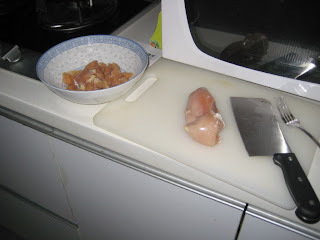 Most places use dark meat, but I happen to use chicken breasts because they are easier to cut up. 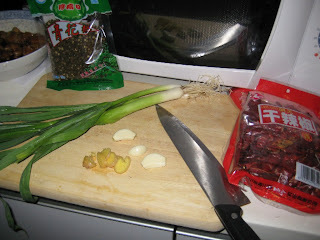 You can also use white or yellow onion. 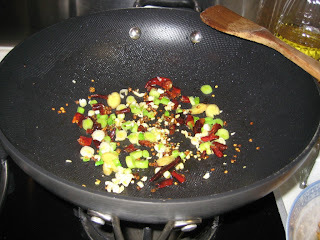 In a wok or large pan you put in two tablespoons of vegetable oil and heat that. 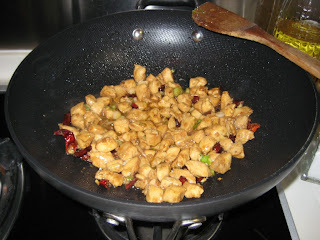 When the oil is hot enough add the chicken and stir fry it until the chicken turns white. 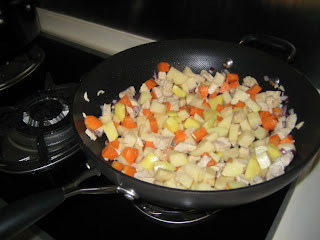 Then add the vegetables in and stir fry them together for a minute or two. Then you want to add enough water to cover everything. Bring it to a boil and then cover and let simmer for about 15 minutes. The curry mix is solid and comes in a package. It is formed in blocks, sort of like a big candy bar. Break it up and add it to the mix. 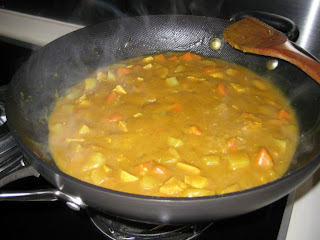 The solid curry mix will melt pretty quickly. Stir it into the mix and then cover it up and let it simmer again for about 5 minutes. 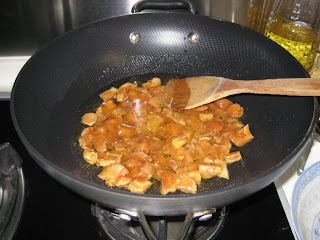 After it simmers a few minutes check it to see if it is too dry or too wet. If it is too dry then add some water and stir well. If it is too wet then let it cook on low heat uncovered for awhile. To serve it, just ladle it out on top of some rice. Enjoy! 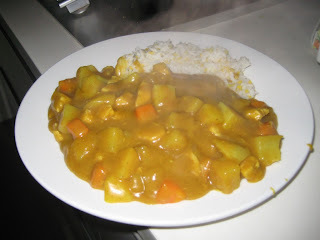 One thing I discovered is that if you forget to use your fan above the stove top is that your kitchen will smell like curry for a long time. Haha! 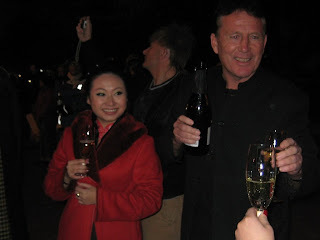 Chinese New Year (often called Spring Festival here) was yesterday. 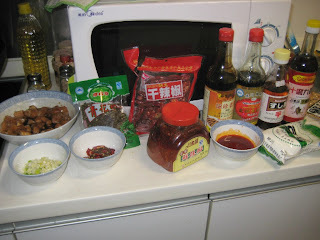 The day before last I met up with my friend Kitty at a grocery store near where she lives and we bought a bunch of food to make a Spring Festival dinner. Actually, her plans changed so we ended up making lunch instead. 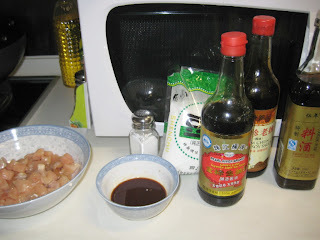 We decided to make some dumplings, steamed shrimp, green beans, and kung pao chicken. I have made dumplings before, but never made the filling before. 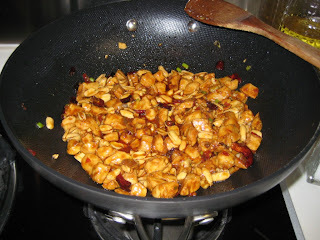 The filling was made up of ground pork, minced ginger, a dash of salt, a dash of pepper, and some vegetable that is like a spring onion, but not as strong. One of Kitty's roommates help with the cooking too. We also had some strawberries and fruit juice. After lunch I went home and took a nap. We had ate a lot. In the evening I went to the only place that I knew that was open... Shamrock Pub. There was a pretty good size crowd that night... mostly foreigners. 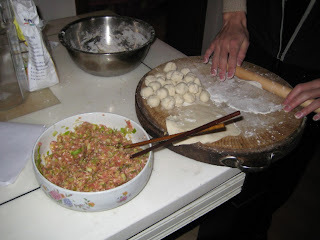 At one point in the evening we had a dumpling making contest. 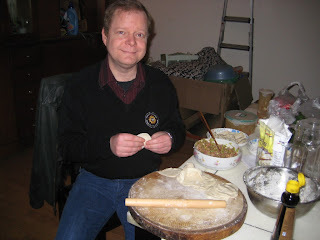 I made dumplings earlier that day, so I got chosen to be a judge. 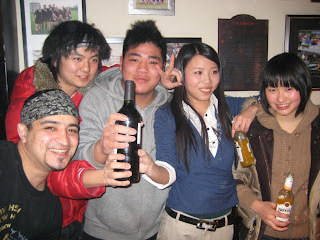 The winning team won a bottle of red wine. 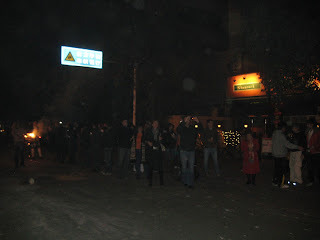 At midnight we went outside and shot off a bunch of fireworks and watched as most of ChengDu did also. At one point a little after midnight it started to snow. It wasn't long before it changed into rain though. On New Years day I stayed home and relaxed. Played on the computer a little and read some of Flashman for Freedom. I had wanted to start trying to cook some Chinese food a few weeks ago, but discovered (when Amber came over and cooked for me during the last holiday) that my fan above my stove was not working. A lot of Chinese dishes require a lot of oil to cook, and you need a fan going or else your kitchen will get a little stinky after awhile. Later I found out that there was a switch on the other side of the kitchen that needed to be turned on, so now my fan works and I can now try to cook some Chinese food. 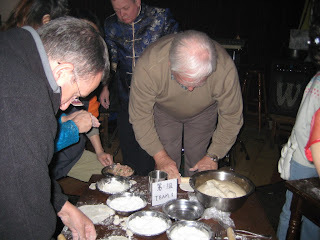 In the lesson Qiang Ye uses corn starch, which is not used here. Here we use potato flour as a thickener. 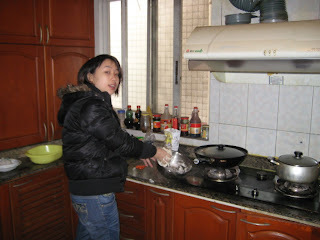 Another change I made was to use 2 cups of rice which when cooked makes about 4 cups of rice. I didn't take any pictures while making my fried rice, but it turned out really well. I was surprised and very happy about it. On Saturday night I went out to dinner with Fiona, and we tried a sushi place at Wanda Plaza. The sushi was kind of so-so, but the restaurant was kind of neat. We sat up at the counter, and they have a little conveyor belt that goes around with a bunch of different types of sushi and shashimi. In the middle are the guys who make the sushi. When you are done the waitress counts your plates, which are color coded depending on the price of the dish, and figures out the total cost of the meal. 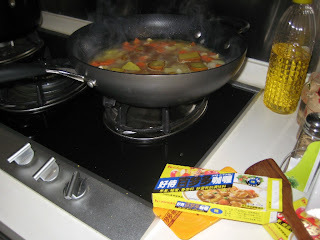 After dinner we went to a store and I bought some groceries for what I wanted to cook on Sunday. Half tablespoon of dried Sichuan flower peppers (very spicy). ...and also cut up the vegetables, put in a small bowl and set aside for later. The three small bowls (from left to right) are vegetables, peppers, and sauce. Mix all that in a small bowl and set aside for later. 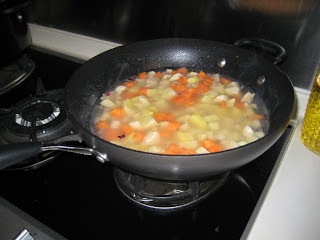 I then put about 2 cups of vegetable oil in a wok and heated that up. When it was hot enough I added the chicken in and cooked that about half way. 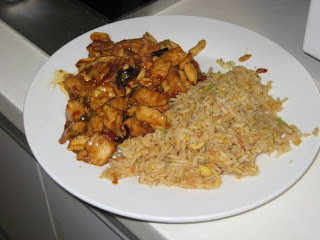 This was the first time I had cooked this, so I was not too sure if it would turn out good or not, but after added the sauce it really started smelling wonderful, so I was kind of happy. There were two things wrong though... first, it turned out to be really really spicy. Second, it was a little too oily. 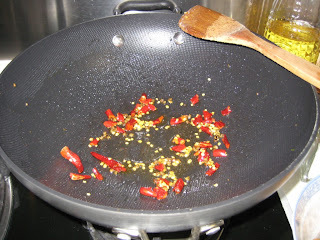 So if you are going to make this dish you will want to reduce the amount of chili peppers, Sichuan flower peppers, and/or chili bean paste, as well as reducing the amount of oil used. I also could have probably added another chicken breast and some more spring onion without changing any of the other ingredients. I think I will have to practice making this some more before it gets as good as I would like. 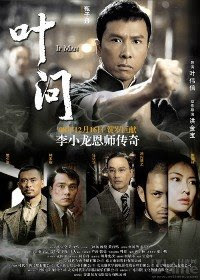 Last week Tina and I went to see the movie Ip Man (Grandmaster Yip Man will be the international English title). The original is in Cantonese, but the version of the movie I watched was in Mandarin. Who ever did the voice-overs in Mandarin had really good accents, since I had an easier time understanding them than I thought I would. The movie is a story based on Yip Man, who was a Grandmaster of Wing Chun style kung fu and was famous for being Bruce Lee's teacher. The way this movie was put together is different than most martial arts movies in that it isn't really an action movie. There are some martial arts fights in the movie, but there is a lot more to the movie. There are so many different elements weaved through out the story that it was easy to see why the audience seemed very moved at different times for different reasons. It is definitely a movie that even people who do not like kung fu movies would like. Of course, the martial arts scenes were very very good. Wing Chun style kung fu is really fluid, and watching Donnie Yen perform this martial art is just beautiful to see. Hiroyuki Ikeuchi's karate is also amazing to watch when he finally unleashes all his speed and power. I won't go into much of the details of the story, but the only part that I didn't care for was that latter part of the movie wasn't very historically accurate. I have not been able to find any stories of Chinese and Japanese martial arts competitions during World War II, and I can not imagine the Japanese putting themselves in the position of doing martial arts competitions with kung fu masters in occupied China. From what I have been able to find, the Japanese asked Yip Man to teach some of their soldiers kung fu but he declined. It seemed to me they made these changes to Yip Man's life story, not so much to make the story more exciting, but more to increase the nationalistic mood of the movie. When we were leaving the theater I heard someone say that watching a movie like that makes them hate the Japanese even more. I doubt if many people watching this movie outside of China would think this way (I didn't); but there is no shortage of movies and TV shows here (that are mostly fictional) that run along the theme of hating Japanese, or hating Manchurians, or hating so-and-so. It's kind of depressing sometimes. Even though part of the movie was not historically accurate, I would recommend the movie. It was very good. Audience reaction (both inside and outside of China) is so good that they have already got the green light to start on the sequel. I do not know what the sequel will contain, but I disagree with the article at Twitch which says that the original movie needs no continuation. I think it would be interesting to see a movie about Yip Man and his students, especially Bruce Lee. Back at work today after two weeks vacation. Today is Sunday and we are working today so that we could have off last Friday without using a vacation day. Most of our customers are still on holiday, so it's not too busy today. Probably the most enjoyable part of vacation is not having to get out of bed at any particular time. Usually I sleep about 6 hours a night during my work week, but during vacation I sleep anywhere from 6 to 12 hours. So, what else did I do during my vacation (besides sleep)? Most of the time I spent playing Everquest 2 (EQ2), reading Flashman and the Mountain of Light, shopping, cooking, and eating, as well as attending a few parties. The first two days of vacation was spent sleeping and playing EQ2. In EQ2 they were having their Christmas event, which is called Frostfell. It was a lot of fun little holiday-type quests, and there were a some holiday-type fluff items that you could get for you characters, as well as some very good items. It was pretty fun, and I got a lot of junk for all of my characters. The day after that I joined Amber for lunch at a really nice Sichuan restaurant. 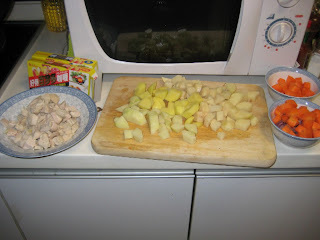 Then we went to Carrefour and shopped for a new rice cooker and a bunch of groceries. Amber cooked dinner for me that evening at my apartment. She cooked a soup made of egg and seaweed; a dish made of sliced pork, celery, and ginger; and also cooked some rice using my new rice cooker. It was very good. I wanted to try to cook some Chinese dishes during the holiday, but discovered that the fan above my stove was not working. Something you definitely need when cooking with all that oil. On Christmas Eve I went out to a party with Tina. I know Tina likes to sing, but did not know she liked to dance and it turns out she is a really great dancer. I can not remember when the last time I had such a good time dancing with someone. I wish I hadn't forgot my camera... Oh well. Sometime during the party I ran into the owner of the Shamrock Pub and he invited me over for Christmas dinner. I spent Christmas day sleeping and reading more of Flashman and the Mountain of Light. Probably not the most appropriate thing to be reading on Christmas (Flashy is so anti-religous sometimes), but it was nice to read something other than technical manuals. On Christmas evening I went over to have dinner at the Shamrock Pub, and they had a very nice dinner setup for us. The owner had invited about 20 of us over for dinner. 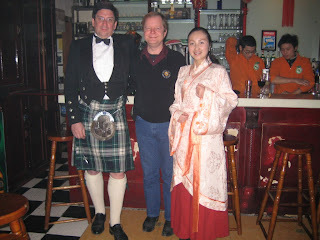 The guests were from the Australia, Belgium, China, England, New Zealand, and me from the USA. For dinner we had steak and salmon, or chicken and ham; as well as a salad, vegetables, and a Christmas pudding (which is sort of like fruitcake with rum in it). It was all very nice! Forgot my camera again... drats! The next few days were spent sleeping, eating, reading, playing EQ2, etc... Pretty much just relaxing and hanging out at the apartment. One night I watched the movie The Mummy: Tomb of the Dragon Emperor. It was an ok action-packed adventure that is a good way to waste an evening. I'll have to see if I can find that one on DVD. I also watched a Redskins game that my Father had recorded on DVD and sent to me. I miss being able to watch football. If the Redskins ever have a good season I am sure I will miss it even more. 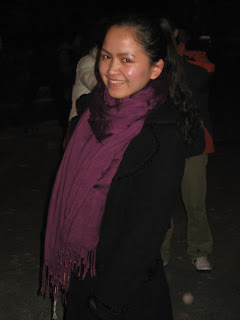 One day I got together with Reese and we went looking for a Muslim restaurant we had heard about near the south gate of Sichuan University. Luckily our taxi driver knew where it was, and we didn't have much trouble finding it. We had dapanji, lamb kabobs, naan (bread), and some lamb soup. The place that we usually go for dapanji has much better dapanji than this place, but that is all they serve. This new place had a lot more to choose from. I guess if I ever want dapanji I will go to the old place, but I'm sure to go back to the new place to try some dishes from Xinjiang province. On New Year's Eve day I got together with Amber and we went out to lunch at a Korean restaurant I had heard about. 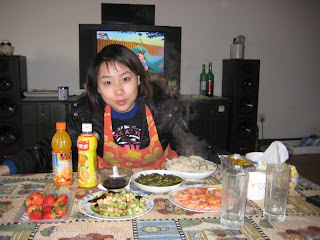 The food was very good, but a little more costly then the other Korean place I had been to in ChengDu. It turns out that the manager (owner?) of the place is from Korea and we got a chance to talk a little bit before leaving. I use to live in Korea 24 years ago (has it really been that long? ), and I was surprised at how much of my Korean I had forgotten (yep... long time). After lunch I went back to my apartment for some more sleep and a little EQ2. Amber and I were suppose to meet up that evening to go to a party, but she canceled at the last minute so I went by myself. The party was very crowded and I got to see a lot of old friends and meet a bunch new ones. Forgot my camera again. After the big countdown I was hanging out with two young ladies, one of whom I knew from before and one I had just met that evening. They were both a lot of fun to chat with. We left the party at around 3:00am and decided to go to a bath house that was nearby. This was the first bath house that I had been to in ChengDu. I had been to a Korean one in Dalian before, but this was a little different. The ladies went off to the ladies' section and I wondered off to the men's section. First stop was the sauna where I sat and sweated as much of 2008 out of me as I could. Then a long soak in the hot tub. Ahhh. After that I was given some pajama-like outfit to wear, and then I went looking for a cigarette and the ladies I had come with. Like almost everything in ChengDu, the bathhouse was a very relaxing place. There were lots and lots of people sprawled out on couches and big comfy chairs everywhere. Some people were still up playing mahjong, but most of the place was snoozing. Eventually I found the ladies I had come with. One of them curled up on a big comfy chair and went to sleep, and I ended up talking to the other one for a few hours. Eventually I went home and to bed. I think it was a little after 7:00am. On New Year's day I slept most of the day. I woke up for a few hours in the afternoon, since my housekeeper came over to clean. I had forgotten to tell her she did not have to come over that day. After she left I slept some more and then got up at around 7:00pm to have some dinner and I watched the movie The Express (The Ernie Davis Story). That was a pretty good movie too. Reminded me how crazy the crowds at WVU football games were when I went to school there (but not for the same reasons now). After that I went back to sleep and didn't wake up until later the next day. Friday was just a lot of eating, reading, and playing a little EQ2. Yesterday I went to Hooters for brunch and had the steak and eggs, played some more EQ2 in the afternoon, and then went to join my friends Cynthia, Tony, and some friends of Tony's for dinner at a hotpot place. It was a nice way to end the holidays.